This topical research effort contributed to the firm wide Resilient Cities Project. The pro bono Project, led by CEO Gerdo Aquino, seeks to improve the quality of life in dense urban places around the globe through partnerships with city leaders, research, site visits and meetings, and a charrette-workshop focused on a relevant local and regional issue. 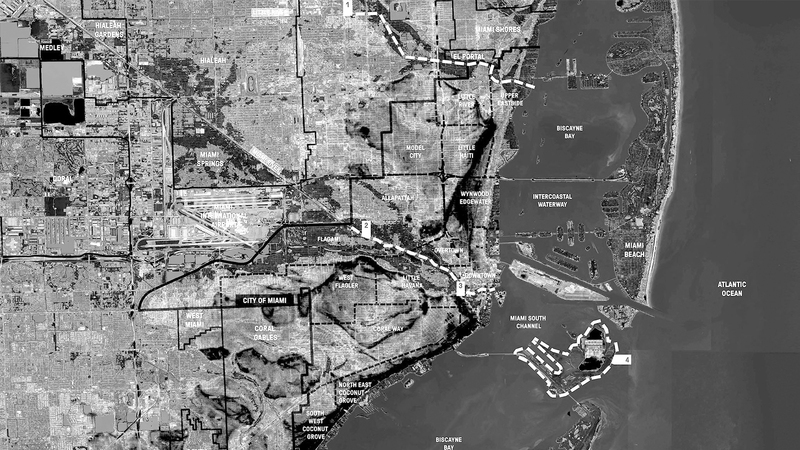 The research for the Miami edition supported three SWA teams focusing on three scales and six sites by providing place-based information, site information, and background material on risk, resilience, projections, and coastal strategies for adaptation, both physical and planned. The research team gathered findings in a briefing book that included: regional and site basemaps showing city jurisdictions and neighborhoods, transit and circulation, flooding extents at 1-foot increments, median income, and land use; site information; a visual glossary covering specialized terminology and local issues like porous limestone, backflooding, saltwater intrusion, storm surge, king tide, hurricane history, barrier islands, and tidal marshland; and an appendix with documentation from partner agencies, relevant news articles, and excerpts from select reports. Public presentation of charrette results. James L. Knight Convention Center. Miami, FL. Gerdo Aquino, Kinder Baumgardner, Tom Balsley. ASLA Annual Meeting. “Incubating Innovation in Practice: Models from Architecture, Engineering, and Landscape Architecture.” Anya Domlesky. HKS Green Week. “Resiliency in the Landscape: Case Studies and Insights.” Emily Schlickman and Andrew Gressett.